The 145.800 MHz FM Slow Scan Television (SSTV) transmissions from the International Space Station on December 5-6 should be receivable by radio amateurs around the world. 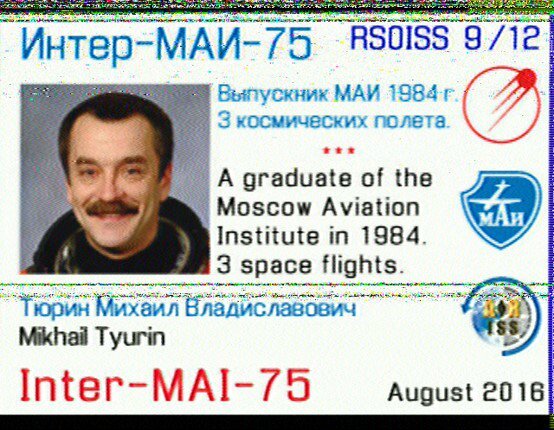 There should also be SSTV activity on December 7 and 8 at times when the ISS is in range of Moscow. The MAI-75 SSTV system in the Russian Service Module will be put through some extended testing from December 5 starting around 15:00 UTC and running until 09:00 UTC on December 6. Test images will be used during this period. This will provide near global coverage if all works well on 145.800 MHz FM. In the past images have been sent using the SSTV mode PD120, with a 2-minute off time between each image. All you need to receive SSTV pictures direct from the space station is to connect the audio output of a scanner or amateur radio transceiver via a simple interface to the soundcard on a Windows PC or an Apple iOS device, and tune in to 145.800 MHz FM. You can even receive pictures by holding an iPhone next to the radio loudspeaker. The ISS puts out a strong signal on 145.800 MHz FM and a 2m handheld with a 1/4 wave antenna should be enough to receive it. Many FM rigs can be switched been wide and narrow deviation FM filters. For best results you should select the filter for wider 5 kHz deviation FM. Handhelds all seem to have a single wide filter fitted as standard.